Red Lotus. . Wallpaper and background images in the अवतार- द लेजेंड ऑफ कोरा club tagged: photo. But here's what I don't get. I believe Mike said something about Ming being without arms since birth due to some illness. And then Bryan made a comment saying that this was an accurate portrayal of their teen years, despite what Mike just said. Why the blasted devil are these two creators never on the same page? How are we supposed to know what the backstory for these guys is, when the writers didn't provide one and can't get their story straight? He did yes, she was born without arms. Though I think it would have been neater if she lost them when she was a teen. I actually saw this in the Art of the Animated Series book. Within the book (as a caption) they said that this was not an accurate depiction where Ming's arms were concerned. But they liked it no less. ^ I think that would have been a neater backstory too. I never know what to believe with them. 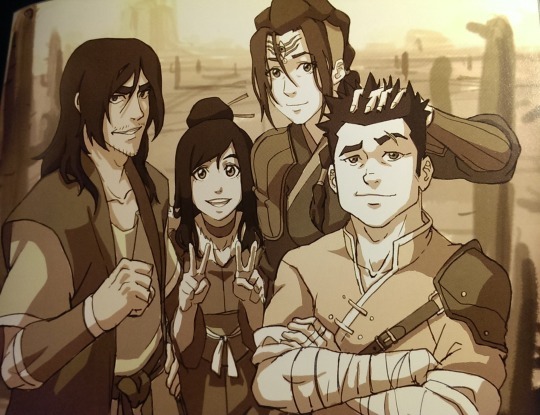 I saw one of them reblog it on Tumblr and he said we should be "sympathetic to the innocent youth of the Red Lotus" and he's on board with the 'she had arms' thing. Like come on.... stick to one story! I think they both said that we should be sympathetic. But I don't follow them on tumblr so I wouldn't know lol.